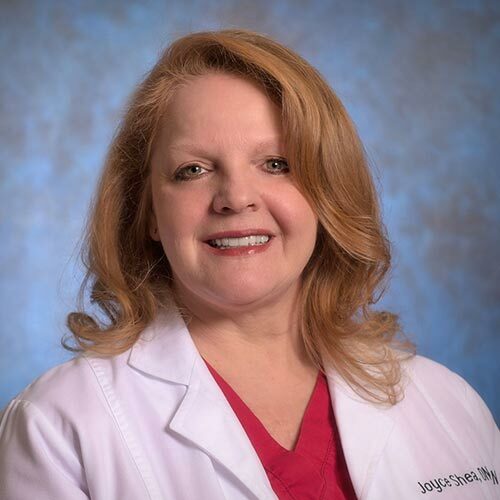 Dr. Joyce is an Acute Care Certified Registered Nurse Practitioner. She received her Masters of Science in Nursing and Doctorate of Nursing Practice from University of Alabama in Huntsville. She teaches Master-level nursing students from the University of Alabama in Huntsville, University of Alabama in Birmingham, Walden University, Troy State University, South University in Montgomery, and Mississippi University for Women. Dr. Joyce has extensive medical experience as a paramedic, Intensive Care and Emergency Department nurse. Prior to employment with True Medical Group, Dr. Joyce worked as a CRNP with a local cardiologist for 3 years. Dr. Joyce hails from East Tennessee. She and her husband, Thomas, relocated to the Shoals area in 1987, as Thomas is originally from the Shoals. They have 2 grown children and 3 grandchildren.